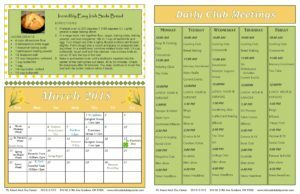 Checkout the new classes and activities we have coming up this month! This month we are excited to announce that we are partnering with Multnomah County’s Family Caregiver Support Program and hosting a 6 week class. 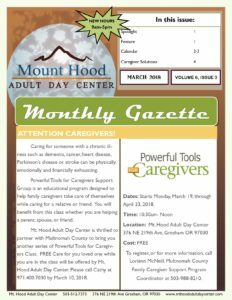 Powerful Tools for Caregiver is featured on the front cover and goes into detail about the benefits offered through this support program. Click on the link below for the full story. 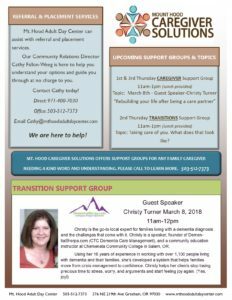 Transition Support will be featuring Guest Speaker Christy Turner from Dementia Sherpa on Thursday March 8, 2018. Powerful Tools for Caregivers Support Group is an educational program designed to help family caregivers take care of themselves while caring for a relative or friend. You will benefit from this class whether you are helping a parent, spouse, or friend. Caring for someone with a chronic illness such as dementia, cancer, heart disease, Parkinson’s disease or stroke can be physically, emotionally and financially exhausting. Mt. Hood Adult Day Center is thrilled to partner with Multnomah County to bring you another series of Powerful Tools for Caregivers Class. FREE Care for you loved one while you are in the class will be offered by Mt. Hood Adult Day Center. Please call Cathy at 971.400.7030 by March 10, 2018. Class meets for 90 minutes once a week for six consecutive weeks. Dates: Starts Monday, March 19, through April 23, 2018. To register, or for more information, call Loriann McNeill, Multnomah County Family Caregiver Support Program Coordinator at 503-988-8210.